A lacquer rectangular tray inlaid in mother-of-pearl, with indented corners and a slightly flared rim, supported on a short foot. 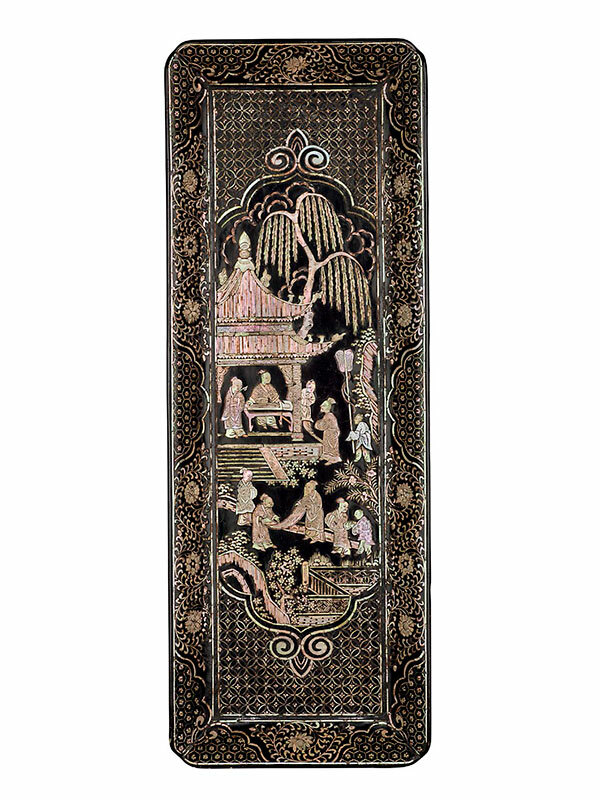 The interior is decorated all over with intricately inlaid designs consisting of finely cut pieces of mother-of-pearl, against a black lacquer ground. The centre of the flat surface depicts scholars in a garden setting. 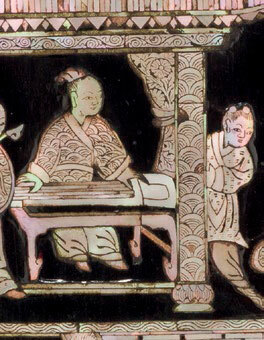 There is a tiled pavilion on the upper left under a willow tree, with a scholar playing a string instrument inside, accompanied by two attendants, whilst a visitor approaches him. A group of scholars examine a scroll painting in front of the pavilion, beside garden railings and stones. The scene is contained in a bracketed cartouche, against a background of interlaced coin pattern. The flared sides are decorated with flower blossoms amongst swirling tendrils, separated by shaped cartouches containing hexagonal diapers. The exterior is lacquered black. The tray is contained in a silver pouch and a Japanese wooden box.